The playzone play areas cater for children of all ages. Climb Tyrannosaurus Towers for an exhilarating slide, choosing the tallest tower for the greatest thrill! Experience the Triassic Treetops Adventure Play. Climb the netted walkways through the trees and slide the spiral slide to discover the tunnels below. Enjoy the indoor play area, crammed with brightly coloured tubes, balls, tunnels and slide. There is also a separate soft play area for under five years. You can enjoy the indoor play whatever the weather! Don’t forget to ask about our party packages. A miniature railway carries passengers around the gardens. The British made locomotive has been operating since 1989 and has delighted many thousands of passengers of all ages. 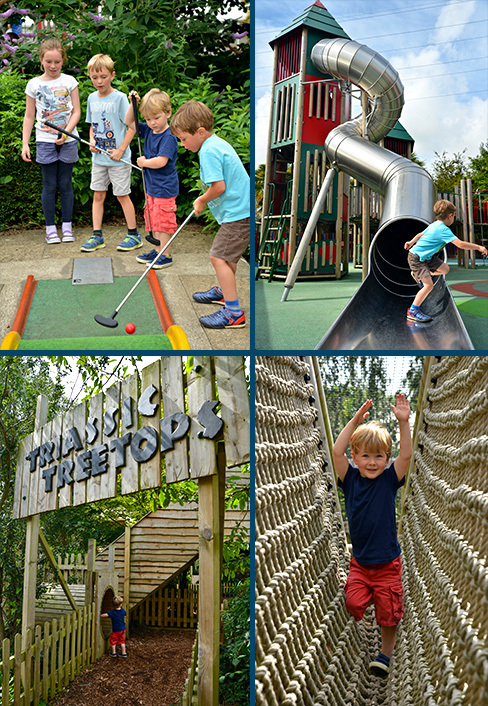 A round of nine hole crazy golf course offers a fun challenge for all the family. Other amusements are available for you to enjoy. There are regular competitions and events in the school holidays to keep children entertained. Don’t miss Santa’s Winter Wonderland this Christmas! The coffee shop at Paradise Park Garden Centre next door, offers a varied menu with a focus on creating fresh meals cooked to order.